Casa de Campo is amazing for family vacations because there’s something for everyone. It has tennis courts, a country club, a golf course, and a marina, so everyone in the family can find something to do. Las Colinas itself is spacious enough for large groups, and the bedrooms are spread out between two levels. Plus, it has a pool, hot tub, and a playground, so you can sunbathe while the kids play on the lawn. 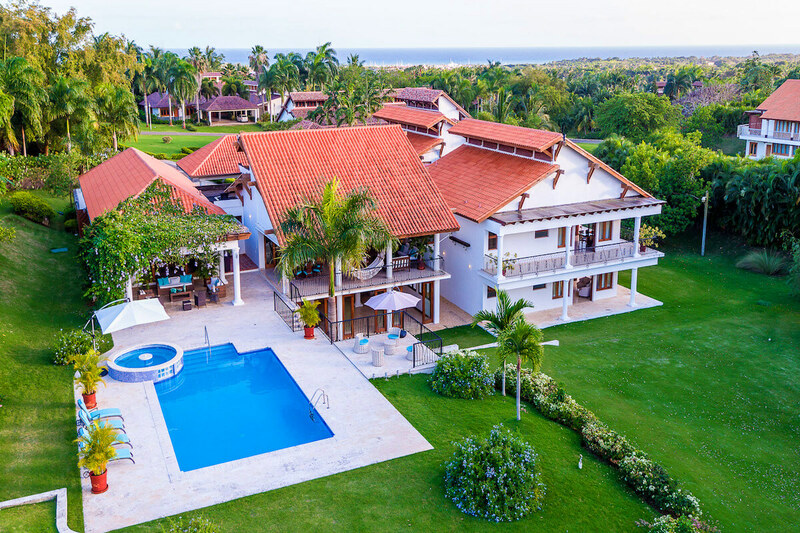 Located in Casa de Campo Resort boasting incredible views of the golf course! Las Colinas 17 overlooks the first hole of Casa de Campo’s pristine golf course. This fully air-conditioned property offers sophistication and seclusion for a large group of friends or family. The veranda offers multiple spots to lounge, sunbathe, and dine al fresco. A hammock and living space sit under the terra cotta roof, and another living space sits opposite under an awning. The large swimming pool and hot tub are surrounded by a lounging deck, and there’s dining tables next to the grill and next to the pool. The kid-friendly lower level has a playground and a large lawn. Perfectly manicured grounds surround the home, and there’s a gym with two treadmills and a TV inside the lower level. A massive chandelier sits above the large living room, which has a modern, minimalistic style and tall glass-paned French doors leading out to the veranda. A powder room sits between the entryway and the living room. The nearby dining table seats 14, and the fully equipped kitchen has wraparound granite countertops and a bi-level center island. There’s a media room with a flatscreen TV and plush furnishings on the opposite side of the entryway. This level also holds four of the six bedrooms. The master suite features a king bed, a breakfast nook, a walk-in closet, and an ensuite bathroom with two stand-alone showers. The second suite has a king bed, and the third and fourth suites each have two queen beds. All three suites have a private bathroom, a walk-in closet, a TV, and direct access to the balcony. A stone staircase leads down to the lower level, which features a family room and two suites. The family room stretches across the majority of the floor with an entertainment center, ping pong table, air-hockey table, and pool table. Both of the bedrooms have a walk-in closet, a flatscreen TV, an ensuite bathroom, and direct access to the garden. One suite has a king bed and the other has two queen beds. Las Colinas 17 is staffed with a butler and daily housekeeping. Casa de Campo is surrounded by several restaurants, and there’s an amphitheater nearby. In addition to the golf course, the resort has a tennis center, a country club, polo fields, and a marina. There is an 11 minute car ride to Minitas Beach. Upon arrival guests will be met at the La Romana Airport by a driver and transferred to the villa. A resort registration fee is required during your stay in order to access all Casa de Campo amenities and services. The charge is US$25 per night from 12 years old and older and US$12 per night for youths between the ages of 4 to 11 years old. This will be charged directly by Casa de Campo resort. Car rental, golf cart rentals, private chef, server, grocery and beverage shopping (pre-arrival and during your stay), liquor and wine delivery, nanny service, baby equipment, spa services, yoga and personal training, and photography can be arranged for an additional fee.